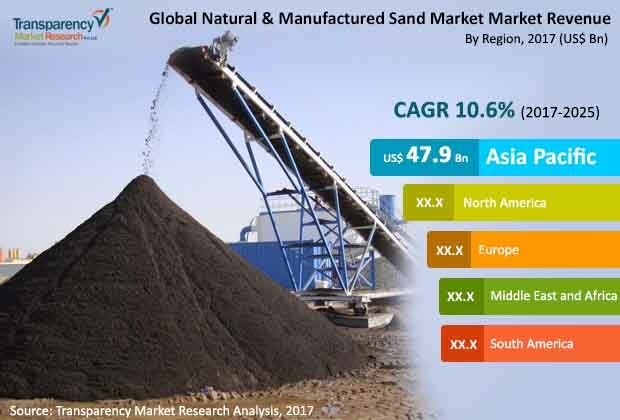 According to a latest Transparency Market Research report, competition in the global natural and manufactured sand market rides on the back of quality. Most players, especially providing manufactured sand are growing in size due to the quality of their products. Besides this, companies in the global natural and manufactured sand market are adding technologically advanced devices in their manufacturing facilities to meet the environment norms and international standards. Further, expansion of production facility to cater to the growing requirement, and the creation of new facilities to expand their global footprint are some other common strategies adopted by companies. The major names in the global natural and manufactured sand market include Adelaide Brighton Ltd, CEMEX S.A.B. de C.V., CDE, CRH Plc, Hutcheson Sand & Mixes, Heidelberg Cement AG, and Vulcan Materials Company. The global natural and manufactured sand market was valued at US$44.4bn in 2016 according to the latest TMR report, and is expected to grow at a competent CAGR of 12.7% during the forecast period of 2017 to 2025. Globally, Asia Pacific is expected to acquire the largest share of the global natural and manufactured sand market in the coming years. TMR analysts predict that this region will alone account for 54% of the entire global natural and manufactured sand market. Industrialization and real estate is at its peak, especially in regions like Asia Pacific. With development stoking demand in various sectors, most industries are expanding at a substantial pace, accentuating consumption of products from the construction sector. Sand is a mandatory requirement for construction, and as a result, the demand for products in the global natural and manufactured sand is expected to soar in the coming years. Development in economies like India, China, Malaysia, and Korea has resulted in growth of individuals at the economic level. As a result, people’s ability to afford homes has improved, thus rising demand in the real estate sector. This directly affects the demand for sand, hence players in the global market for natural and manufactured sand will have to cater to higher demand during the forecast period. The rising impact of environment on mining sand is expected to aggravate demand for manufactured sand. River sand is preferred for construction due its exceptional ability to bind well with cement, thus improving quality of the construction. However, over the years, rampant excavation of river sand has led to loss of river ecosystem and water. Hence, many governments across the world have introduced stringent laws on illegal sand mining. This has stoked demand for manufactured sand over the years, thus growing consumption in the global natural and manufactured sand market. While strict laws are in place to govern mining natural sand, rising concerns over pollution caused while producing artificial sand has provoked policy makers to introduce laws for manufactured sand, too. This is expected to restrict growth in the global natural and manufactured sand market in the coming years. However, the rising demand from real estate and industrial sector will continue to infuse demand in the global natural and manufactured sand market in the coming years. Besides, the growing need for renovation in regions like North America and Europe to give buildings a modern look will stoke demand in the global natural and manufactured sand market.